The wonderful thing about studying plankton is that they are not a single species, but rather the collection of hundreds of creatures too small to move any great distance without the assistance of ocean currents. It’s like looking at a tiny ecosystem that exists in every cubic meter of the sea, comprising of plant-like phytoplankton, tiny hunting zooplankton and larvae of animals such as crabs, fish and bivalves. Every species is wildly different, with each tiny body under the microscope having a unique lifestyle. Resident plankton expert of the MBA, Dave, took us out to observe the plankton life living in the Plymouth Harbour, just a stones throw away from the labs. 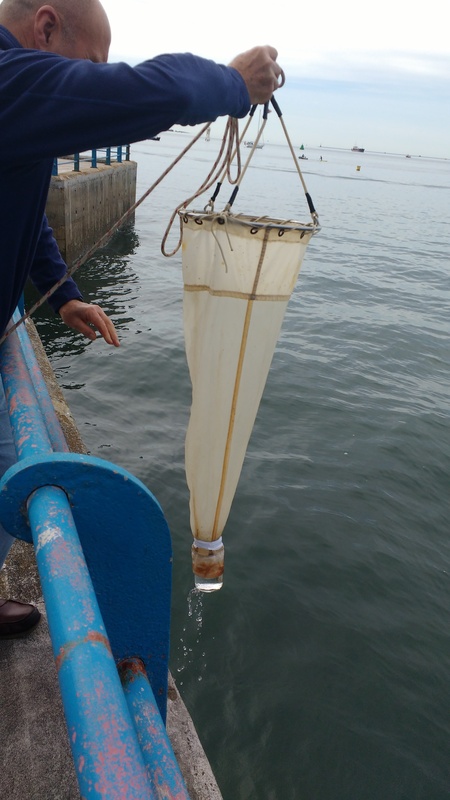 Taking a fine, cone-shaped net attached to a high tech jam jar, he filtered a selection of plankton straight from the water. He only walked about 20m with the net in the water, and it wasn’t at all deep, but the wide variety of life we found under the microscope was astonishing. Even knowing that plankton were a diverse form of life, with around 5000 species in Plymouth alone, it was shocking to see the variety of each tiny lifeform. Some species of plankton have extremely complex lifecycles, in particular the species of meroplankton, which are only planktonic for the first part of their lives, eventually turning into the larger sea species everybody commonly enjoys in their rock pools. The barnacle is an excellent example of this, living in two planktonic stages, a free-swimming nauplis which moults around 5 times before becoming a non-feeding cyprid which will use its oil energy reserves to burrow into an area of rock, ready to take root and become a sedentary adult. Looking down the microscope we saw such barnacle cyprids, comb jellyfish, which aren’t the same as true jellyfish, water fleas, algae and tiny fish. It was extremely interesting to see what microscopic life was living in every cubic inch of water that covers the earth, a truly amazing prospect considering the size of our oceans. Countless billions of tiny organisms live around us, too small to see, and all too often out of mind.